Every job, passion, and hobby has a few key components to master before you can start to grow and move toward success. Whether you’re a musician learning the basics of music theory or a lawyer studying important court cases and decisions, it’s necessary to understand the foundational concepts so that you can build upon them. Photography is no different. That said, many creatives run into the same problem after they get the basics down: how to make yourself unique. If you ask CreativeLive instructor Scott Robert Lim, there is an easy formula for that. By practicing and experimenting, Lim quickly turned himself into an award winning wedding photographer by developing a few must-have images at every wedding. Finding these images, which he has dubbed his ‘Money Shots,’ is not just a great way to create your personal style, but it is also a way for you to know what images to capture before you even start work that day. One feature that can really set your ‘Money Shot’ apart from the pack is lighting. As with any image, lighting is one of the most important components that can completely change the photograph. Different situations call for lighting in their own, unique ways, and learning how to control the lighting in your image can allow you to create your own style. So how does Scott Robert light his ‘Money Shots’ ? As with any image, it is crucial to find good natural light. 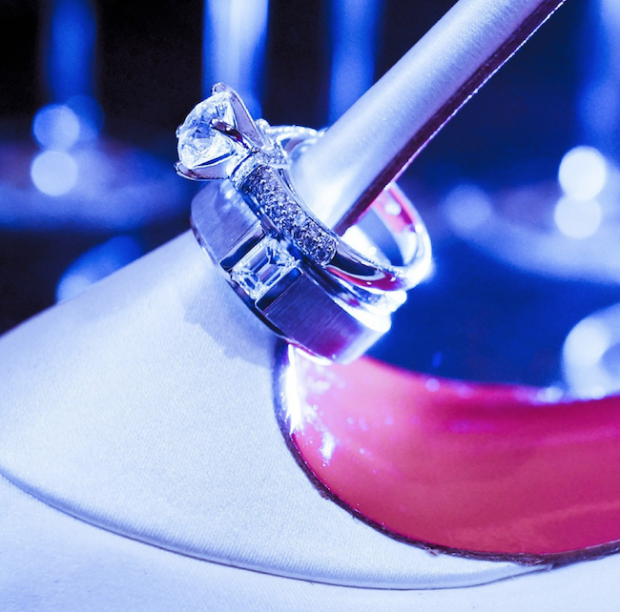 But when shooting the wedding rings, Scott Robert focuses on the details. Since rings are so intricately designed, it is important to get up close and personal to catch all of the nuances. Scott Robert recommends using a video light, either as a backlight or a surface to lay the rings on. 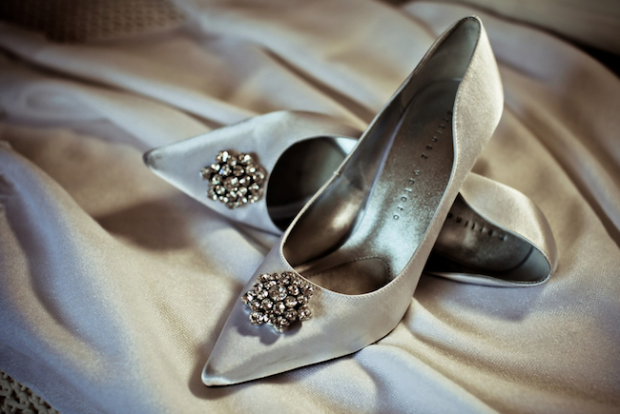 Bridal shoes are a popular subject for images in wedding albums. Scott Robert suggests shooting the shoes on their own, or as the bride is pretending to put them on. In both scenarios, using a video light can serve one of two main functions. It can either be used to quickly create a dramatic light source, or it can be used to fill in light and reduce shadows on the object. 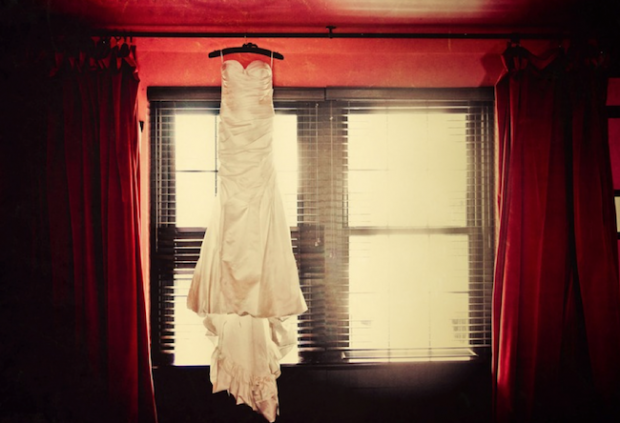 One must-have image in a wedding album is the solo dress shot. Scott Robert’s ‘Money Shot’ is hanging the dress against a strong backlight, using over-exposure to create a flowing look. 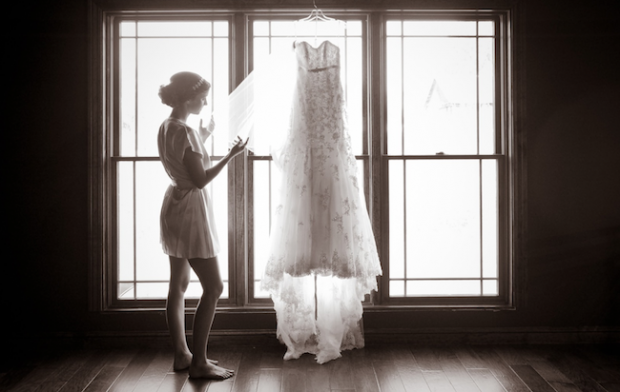 By putting the dress in front of a nice, natural light source, you can add dreamy, fantasy like qualities to the dress and make the image memorable. The bride and her bridesmaids are important to capture together. Whether you do this while they are getting ready, or while they are having a casual conversation, make sure to capture the strong emotions. As with a lot of his suggestions, Scott Robert likes a strong backlit area, which you can over-expose to your liking. Make sure to come with lots of emotion, as the subjects tend to mirror you directly. 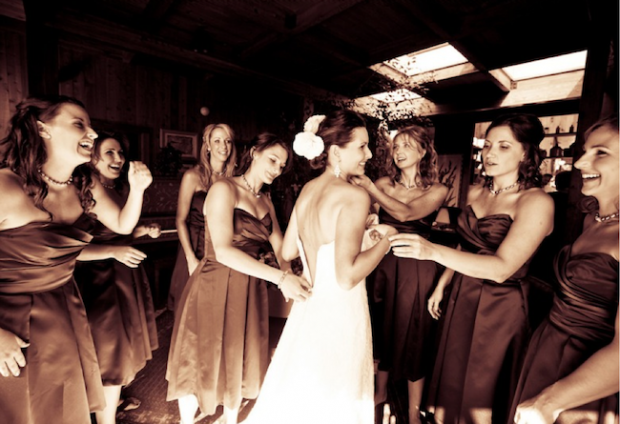 One of the most important images you will capture at a wedding is the Bridal Portrait. Though there are a number of directions you can go with the portrait, but Scott Robert recommends using a full-length silhouette profile. Placing your subject against a backlight and over-exposing can produce a beautiful silhouette. Allowing the natural light in can also produce soft shadows, which can be used to create mystery and drama. Scott Robert advises to pose the subject’s nose towards the light source, and the body away from it. Video light and natural light go very well together. Video light is good to use in high ISO situations, while an off camera flash or a flash with umbrella is preferable in a low ISO situation or outdoors. Instead of readjusting your light source and subject for every image, Scott Robert suggests you change your position while leaving your subject stationary. That way, you can see different angles and see the different ways that light hits your subject. 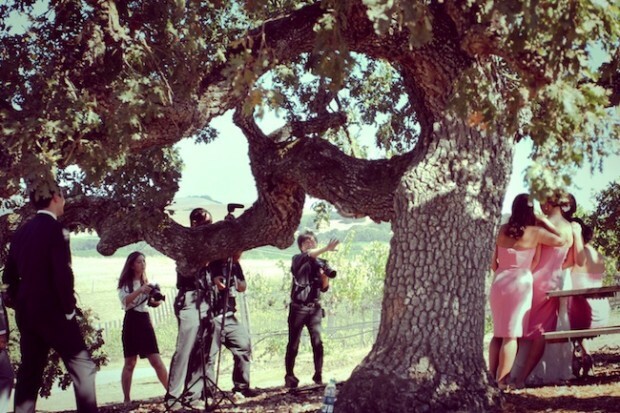 Want to learn more about wedding photography money shots? Check out Scott Robert’s Crazy, Stupid Wedding Light course. Drew is a Seattle-based freelance writer. He spends too much time playing music, binging on Netflix, and watching his beloved Philadelphia sports teams.